The best way to learn how to write is by actually writing, and Focus on Writing will give you all of the hands-on practice and skills you need. Organized with your time in mind, we’ve included plenty of clear, step-by-step lists, relevant practices, and engaging readings. Our TEST (Topic sentence or Thesis statement, Evidence, Summary statement, and Transitions) method will help you self-edit all of your writing for unity, support, and coherence. 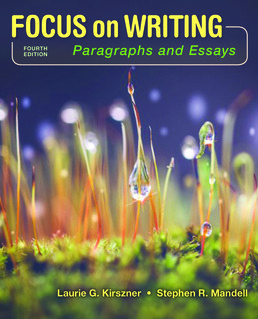 This book includes the essays and assignments you need in order to do your coursework and succeed.